envelope 100: P is for Pixel Art and (maybe) former Princes. P is for Pixel Art and (maybe) former Princes. Although, at the time of this video game release, it wasn't really referred to that way. These amazing stamps were issued in 2017 to celebrate the 30th anniversary of the Spanish video game La Abadía del Crimen (The Abbey of Crime), itself based on Umberto Eco's book The Name of the Rose, which was also made into one of my favorite films starring Sean Connery. 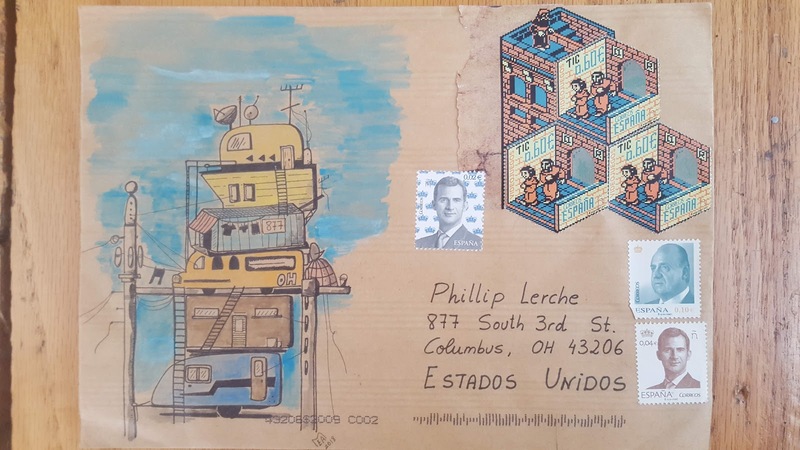 Eva sent the stamps on a great envelope - I noticed right away what the drawing was from - but as a bonus to today's Sunday Stamps guests I thought I'd see if you can guess what it is. There are also some definitive Spanish stamps featuring two kings, who, I presume, were once upon a time Princes. For more links to P-themed postage, head over to Sunday Stamps. I am glad to know that this one made it. And yes, the kings were princes once upon a time (though history is a bit complex here...). I don't like adding these stamps to almost every envelope; but the lower rates only exists as king stamps: no choice here! Yes, His Majesty did arrive - thank you! I didn't think about him for this week (obviously). Eva's drawing is connected to where I live, yes. Unfotunatelly (or not?) I never really immersed myself into video games...Tetris is as far as I went :D However these shaped stamps are something to desire! They can be great, and they can also be a terrible rabbit hole. Love that stamp arrangement although it has set my brain in a spin trying to work out the shape of the stamps. 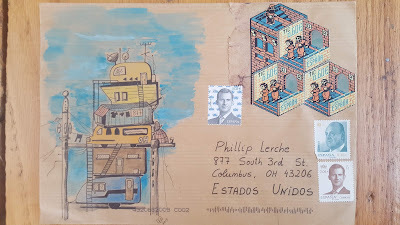 Also love the drawing and although I can see part of your address on there don't know what is from but it is certainly space saving parking. These 2D hexagonal stamps that look like cubes are great, aren't they - Correos did this in the past with their social network stamps. And I love Eva's drawing, that is so beautiful! And of course great findings for the letter 'p', I wouldn't have thought of that and these are so matching! Eva's drawing is great, I knew exactly what it was before I even opened the letter. And I love how she chose browns and blues to match the stamps - really clever piece. I feel left out of this as I can't 'see' the stamps. I do recognise the Princes/Kings however. It is a clever visual trick from Correos, isn't it.